Everyone wants results, right? There’s a famous motivational quote “it’s the days when the body aches, the desire is low, you feel tired and you feel weak… those are the days when champions train” (unknown) but that’s not always the case. I’ve recently learned, through my own experience, that rest days are extremely important in order to recover and improve performance. I went from playing collegiate soccer, training every single day on the field, to working out in CrossFit and weight training classes twice a day. I naively believed, due to my ability to cope with the stress soccer had on my body, it would allow me to cope with training twice a day, six days a week. However, my body soon told me otherwise as my resting heart rate increased, my body weight plateaued and I began having sleepless nights. I eventually strained a hip flexor and could no longer continue on. Eventually realizing, I had in fact been overtraining. Overtraining is defined as “a condition which involves applying too much stress to the body by means of physical activity” (“Over training | Sports Medicine Information,” n.d.). It is seen to be “an accumulation of training and/or non-training stress resulting in long term decrement in performance capacity with or without related physiological and psychological signs and symptoms of overtraining in which restoration of performance capacity may take several weeks or months” (Halson & Jeukendrup, 2004). According to the NSCA, symptoms of overtraining include ones I had previously experienced; muscle weakness and soreness, decreased appetite, increased resting heart rate, decreased performance, increased risk of infection and time required for recovery, and a decreased desire to train (“Overtraining and Recovery”). These can be induced by two principle factors; training intensity and volume. Fatigue is the outcome of an individual’s ability to meet the demands of an activity through aerobic means. If an individual cannot meet the demands of an activity, fatigue increases. While fatigue may increase the likelihood of injury (Woods et al., 2003), the presence of fatigue is essential to increasing fitness. This can be shown through a two-factor supercompensation model, the fitness fatigue model. As shown in the fitness fatigue model (Figure 1), training results in two after effects which can either positively or negatively influence performance, fitness, and fatigue. Whilst, the fitness after-effect have a positive physiological response, the fatigue after-effect has a negative physiological response. The interaction between fitness and fatigue results in a change in performance following the stimulus (see figure 1). The degree to which the magnitude and duration of these after effects occurs is dependent on the stimulus. Whilst, fitness has a lesser magnitude but a longer duration, fatigue is greater in magnitude but has a lesser duration. This relationship exhibits itself as a long term improvement in performance (MacDougall, Wenger, & Green, 1993). On the other hand, elevated fatigue levels, both physically and mentally, for a prolonged period of time can significantly increase the risk of injury due to the compromisation of muscle strength, coordination, mental attentiveness, and concentration. Fatigue can directly impact performance and induce many biomechanical and muscular changes in an athlete’s mechanism and movement. These elevated fatigue levels tend to be towards the later parts of a training session or a game, such as the second half, due to prior demands on the athlete (Whiting & Zernicke, 1998), with it being estimated that around 26% of muscular strain injuries occur in the final 15 minutes of a game (Hawkins 2001). Dr. Matt Greig (2007) found that the body’s physical response to football (soccer) related exercise, which is subsequently induced by fatigue, has high risk implications for injury. 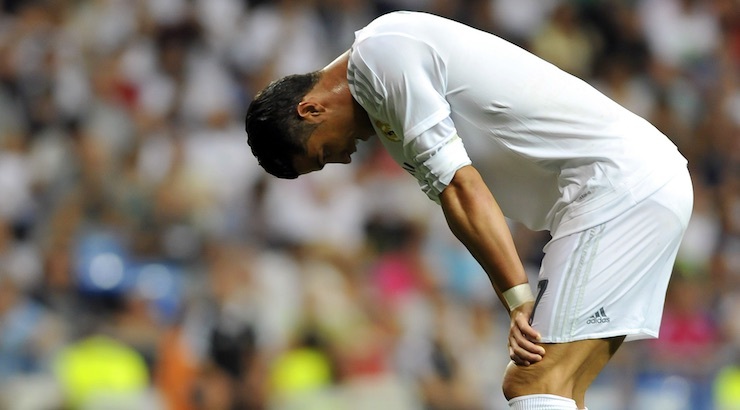 In terms of the specific responses of a football player to fatigue, Dr. Greig found that eccentric hamstring strength did not fully recover in time for the second half of the match. In terms of magnitude and pattern of center of gravity displacement, it was found that dynamic balance was also significantly impaired at the beginning of the second half. At the commencement of halftime, the greatest degree of knee varus displacement was also discovered (“In the moment: Sports medicine | Lower Extremity Review Magazine”). During play, fatigue initiates a decline in the athlete’s ability to continue to maximum performance (Rahnama et al., 2003). Thus, this fatigue prevents maximum performance, which may alter the running mechanics of an athlete, which in turn increases risk of injury due to a reduced functional hamstring to quadriceps ratio value (Pinniger, Steele, & Groweller, 2000). Fatigue produces a significant reduction of the hamstring to quadriceps ratios and dynamic control ratio values. The dynamic control ratio, which compares the opposed muscle actions of antagonistic muscle groups, is thought to be a more relevant measure in terms of knee function and potential risk of injury when looking at the ratio between the hamstrings and the quadriceps. These reduced dynamic control and hamstring to quadriceps ratios result in a reduced capacity of strength production in the lower limbs, more specifically the hamstrings, which subsequently increases the risk of a hamstring injury (“Influence of Fatigue in Hamstrings: Quadriceps Ratio. A Systematic Review,”). Cohen et al. (2015) discovered a decline in strength production and deceleration capacity in the hamstrings interrelated with strength production in the quadriceps in joint angulation when an athlete is near full extension, consequently leaving the hamstrings predisposed to injury (Cohen et al., 2015). Fatigue can also induce many biomechanical and muscular alterations as a result of an athlete adjusting their movement in order to continue to play at their best. This may increase the likelihood of injury due to the recruitment of alternate muscles and techniques. Joshi et al (2011) found that modifications in the lower trapezius induced by fatigue may position the infraspinatus to injury, as a result of chronically increased activation. The study also found that muscular fatigue in the glenohumeral external rotation may contribute to shoulder injuries in athletes who play overhead sports, such as volleyball or gymnastics, due to lack of proper balance between the muscles that act on the shoulder (Joshi et al., 2011). During stop tasks, ACL injury risk is potentially increased, especially in females, due to generalized neuromuscular fatigue. This is predominantly due to the promotion of potentially hazardous anterior tibial shear loading (Chappell, 2005). Fleck and Kraemer (2004) found that when performing drop jumps whilst fatigued, it may predispose athletes to injuries of the lower limbs, due to the association with high impact loads and acceleration (Fleck & Kraemer, 2004). This is a result of the reaction to when the foot makes contact with the ground during landing. As a result of this reaction, a reactionary force then causes a transient acceleration that travels up the musculoskeletal system from the foot to the head (Derrick, 2004). If these impact accelerations and loads happen to be excessive relative to the strength of the muscular tissue, it has the potential to result in musculoskeletal overuse injuries such as stress fractures (Milgrom et al., 1988), osteoarthritis (Whiteside, 2005) or articular cartilage and joint degeneration (Radin et al., 1973). Regarding biomechanical alterations, the onset of fatigue significantly increases hip extension and rotation in athletes, as well as knee abduction and internal rotation and ankle supination angles. During unanticipated landings, hip rotation and knee abduction angles are further increased (Mclean & Samorezov, 2009). Consequently, these increases promote the risk of injury in athlete extensively. In terms of decreases, the onset of fatigue also results in decreased knee flexion angles and moments (Borotikar et al., 2008). In terms of how we can apply this information for an effective prevention of fatigue-induced injuries, this has apparently been a popular area of discussion at multiple American College of Sports Medicine and National Athletic Trainers Association annual meetings. Matt Greig, PhD found that in order to prevent fatigue in football (soccer) players, one must “develop a halftime warm-up to consider biomechanical, physiological, and psychological demands of match play,” due to an athlete being in an impaired biomechanical state when resuming the second half of the game (“In the moment: Sports medicine | Lower Extremity Review Magazine”). McLean and Samorezov (2009) found that target training of central control processes may successfully counter the debilitative impact of fatigue on risk of specific injury as central fatigue is a critical constituent of fatigue-induced strategies for sports landings. Injury prevention strategies should also aim to strengthen the hamstrings, specifically during the eccentric phase, and fix imbalances from the dominant to the non-dominant leg, so fatigue is experienced in both legs concurrently (“Influence of Fatigue in Hamstrings: Quadriceps Ratio. A Systematic Review,”). Therefore, alongside completing injury prevention strategies, an athlete’s training plan should aim to account for both fitness and fatigues after effects in an effort to maximize training effects and improve performance whilst avoiding injury through fatigue and/or overtraining. Because no one wants to be prevented from exercising or training through injury right? Borotikar, B. S., Newcomer, R., Koppes, R., & McLean, S. G. (2008). Combined effects of fatigue and decision making on female lower limb landing postures: Central and peripheral contributions to ACL injury risk. Clinical Biomechanics, 23(1), 81-92. Fleck, S. J., & Kraemer, W. J. (2004). Designing Resistance Training Programs-3rd Edition.